It is with broken hearts, yet joyful anticipation that the family of the late Myrtle Florence Sacrey announces her Promotion to Glory. 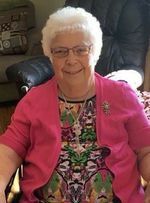 Myrtle passed peacefully into the presence of the Lord from the Central Newfoundland Regional Health Centre, Grand Falls-Windsor, NL on Saturday, March 30th, 2019 at the age of 83 years. Myrtle is predeceased by her husband – Douglas Sacrey; infant daughter – Daisy Sacrey; son – Alvin Sacrey; grandson – Darren Canning; grandson-in-law – Nathan Regular; parents – George and Susan (Elliott) Regular; siblings – Chesley Regular (Gladys), Audrey Greenham (Jack), Eric Regular (Mae), Albert Regular and Melvina Decker (Eleazer); siblings-in-law – Rowena Regular (Mervin), Doris Saunders (Allan) and Graydon Sacrey. Left with fond and loving memories is her children – Ben Sacrey (Joy), Woodstock, NL, Nancy Rideout (Calvin), King’s Point, NL, Vicky Canning (Les), Woodstock, NL, Ron Sacrey (Donna), Woodstock, NL, Leona Norman (Glen), Woodstock, NL and Angela Squires (Leamon), King’s Point, NL; daughter-in-law – Ena Young (Ross), Woodstock, NL; grandchildren – Darrell (Nicole), Kerry (Nada), Kimmy (Dave), Colleen (Rodney), Stacey (Corey), Stephanie (Roger), Deon (Terri), Jonathan (Melissa), Nicholas (Haley), Denika and Douglas; great-grandchildren – Landyn, Kaelan, Marcus, Alvin, Hunter, Connor, Alyssa, Alanna, Preston, Shayla, Isla, Chloe, Weston and Addisyn; brother-in-law – Donald Sacrey (Shirley); sister-in-law – Eileen Richards, as well as a large circle of nieces, nephews, extended family and friends. Majors George and Karen Crocker conducted the Funeral Service from The Salvation Army Citadel, Woodstock, NL on Wednesday, April 3rd, 2019. Interment followed from The Salvation Army Cemetery, Woodstock, NL. As an expression of sympathy, flowers are gratefully accepted or donations may be made in Myrtle's memory to the Salvation Army Memorial Fund, Woodstock Corps.